The new 2007 Lugano Convention, establishing parallelism with the Brussels I Regulation (Reg. 44/2001), had just entered into force in Switzerland in 2010 when it faced a new challenge in the form of the Recast Regulation (Reg. 1215/2012). 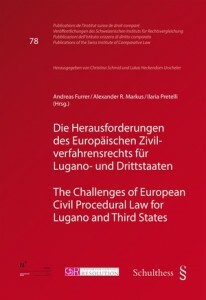 Therefore, in 2014, CIVPRO (University of Bern), CCR (University of Luzern) and the Swiss Institute for Comparative Law (Lausanne) invited professors, researchers, civil officers and practitioners from all over Europe to discuss the future of European civil procedure with a special focus on Lugano and third states. Alexander Markus (Bern), Andreas Furrer (Luzern) and Ilaria Pretelli (Lausanne) have now published the (English/German) volume containing the keynote speeches and the subsequent contributions to this conference as well as the reports on the discussion in the various panels. This book presents and analyzes the past, the present and the alternative conceivable futures of the Lugano model of a “parallel” convention. For further information, click here.